Kids Rugby boots are among the most sought after sports shoes given the popularity of Rugby in the UK. 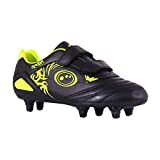 Comfortable Fit: Optimum Unisex Junior Tribal Rugby/Football Boots are made of premium quality materials that can perfectly fit and support your feet while playing football or rugby. It comes with a lace-up closure that can be tailored to your fit for outstanding performance in the field. 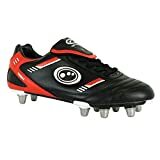 Our football/rugby boots also offer a soft and flexible fit that can match your speed and agility while playing football. 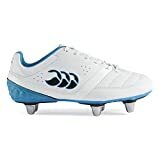 Lightweight: The Optimum Tribal Rugby/Football Boots are manufactured from a lightweight synthetic pro performance PU upper, with outer synthetic material, manmade inner material and EVA sole. With these materials, our football/rugby boots can enhance your speed and agility, as well as improve your overall performance in a football or rugby games. The boots synthetic PU upper also supports you to have a good fit and perform on top speed and acceleration. Durable and Stable: Optimum Unisex Junior Tribal Rugby/Football Boots is complete with ergonomic stud configuration. The boots offer durable stability across the heel and forefoot, which makes it ideal for playing rugby or football. Amazing Color Availability: Our boots come in four amazing different colors. You can choose from Black/Red, Black/Blue, Fluro Yellow/Black and White/Blue. You can match the color of your team uniform with our available boots color. Fits well and Comfortable to Use: The Optimum Boy's Tribal Moulded Stud Rugby Boots can fit your whole feet comfortably. It is made of a soft and flexible material that can empower your performance while playing. The lace-up closure design can be adjusted to make sure that your feet fit well into the shoes. Premium Quality: The all-new tribal rugby boots from Optimum are constructed from high-quality materials, which is complete with ergonomic stud configuration. The boots have an outer material made of a synthetic and inner material made of textile. 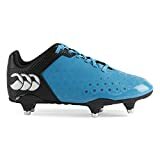 Lightweight: The Optimum Boy's Tribal Moulded Stud Rugby Boots are manufactured from a lightweight synthetic pro performance PU upper, which can enhance your speed and agility, as well as improve your overall performance in a rugby game. The boots synthetic PU upper also supports you to have a good fit that can help you play or train without any problems. 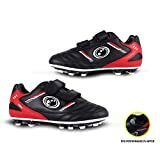 Durable: Optimum Boy's Tribal Moulded Stud Rugby Boots have six-stud configuration that is durable enough to keep traction and stability in the most uneven grounds. The boots also have a sole made of EVA, which is perfect for Rugby field. Amazing Color Availability: Our rugby boots come in two cool and amazing colors. You can purchase the Fluro orange/Black or Fluro green/Black. You can match the color of your team uniform with our available rugby boots color. Soft synthetic with printed design. Built for playmakers. 6-stud TPU outsole with forefoot flex groove, foot-support zones. Nylon upper/aluminium lightweight composite studs. Internal TPU Heel counter. Asymmetric eyestay for maximal control whilst kicking. Synthetic Upper - Lightweight and comfortable. Internal TPU Counter - Provides added durability and support. Reinforcement Zones - For superior support and traction on a multitude of pitch types. Deeper 6 Stud Configuration - Delivers superb traction and grip on demanding surfaces.